Today is the start of another week long (4/2/2012-4/8/2012) blog hop event. This week is different from the usual, It's a What's in Makeup Bag? blog hop event! For how it works and rules please check it out here! Now for what's in MY makeup bag! The bag I use is an old Victoria secret makeup bag. I loooove L'oreal mascaras! It is the ONLY brand I use! Love it! Thank you for sharing and I am now your follower! Thanks so much for following! And I'm not really a L'oreal fan, but this mascara is definitely one of the best mascaras I've tried! i need to do this post on my website! Thanks :) And you should definitely do this post! 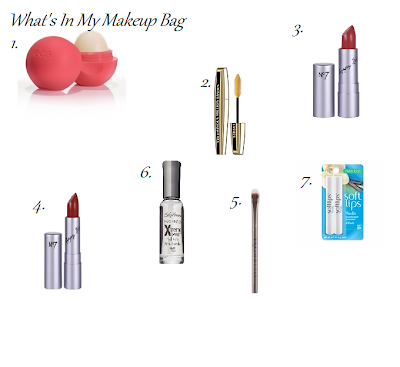 I'd love to see what you have in your makeup bag! OOh I love that mascara aswell! Is the lip balm really that good? The lip balm is really good, and it smells really good too! I almost bought that mascara, but I ended up going with another. I'll definitely try yours next time! Thanks for following! And you should defintely try it out! loreal masacra's are the best!!!! This is the only one I've tried, but I really want to try the others! Thanks so much for following! I've never tried any other l'oreal mascara or any other l'oreal product at that. where do you get the EOS lip balm from? i really want to try it! I get mine from ulta or target. Thanks for following!